Reader Question: Hi, I want to invest in a set of professional quality colored pencils, like the Prismacolors. I would love the set of 120 but I can't afford it right now, yet I can't wait to get started with colored pencil drawing! Can you recommend the basic colors used in colored pencil art, so that I can buy some of them now and hopefully get the rest later? That's great that you are so excited to start drawing with colored pencils. 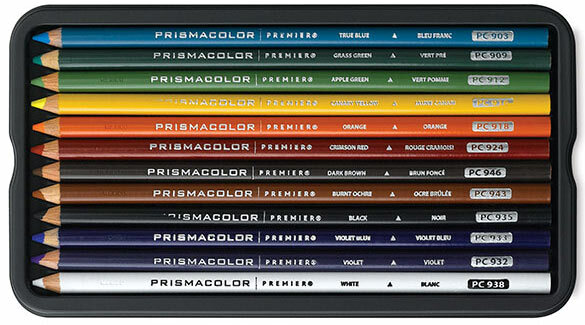 Prismacolor colored pencils are available in sets of 12, 24, 36, 48, 72, 120 and 132. Buying a set is a bit cheaper than buying each of the pencils individually, so I'd recommend getting the biggest set that you can currently afford, and then getting the rest later. Prismacolors' smallest set is their set of 12, which contains the basic colors you'd need to get started with colored pencil drawing: Apple Green, Black, Canary Yellow, Crimson Red, Dark Brown, Grass Green, Orange, Sienna Brown, True Blue, Violet, Violet Blue & White. The set of 24 contains all these colors plus 12 more, and so on with each larger set. Even if you can only afford to work with a small set of Prismacolors, it's still a good learning experience because you can practice blending the colors you have to make the colors you need. Having a small amount of colored pencils pushes you to experiment with the different possibilities, which is an invaluable lesson in the long run. When you're ready to buy more colored pencils, you can buy them individually for a little over $1 each. Depending on the size of your current set and how worn down the colored pencils are, it might make more sense to buy them open stock (individually) instead of buying the full set of 132 and having a lot of doubles. It really depends on how often you use them, as well as your budget.